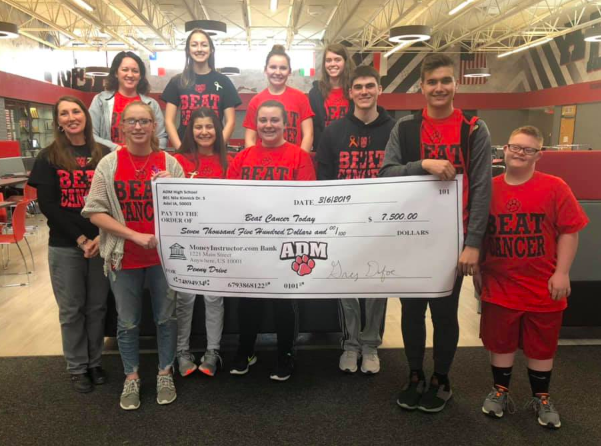 During the month of February, ADM middle school and high school students participated in a fundraiser for Beat Cancer Today. Beat Cancer Today is an organization with a mission to create awareness of childhood cancers and to provide financial support for childhood cancer research, scholarships, and for patient and family support programs. One of the founding members of Beat Cancer Today is ADM alumni Aaron Horn, who graduated from ADM in 1998. Aaron’s son Eli was diagnosed with cancer in June of 2007 and passed away in 2012. To raise funds, ADM middle and high school students engaged in a Penny War, collecting $5554.44 for Beat Cancer Today. An additional $1,295.56 of private donations were sent directly to Beat Cancer Today for the ADM Penny War and $650.00 in T-shirts sales helped add to the total. In all, the ADM Schools raised $7,500.00 for Beat Cancer Today!